HiYa, Ducky here. 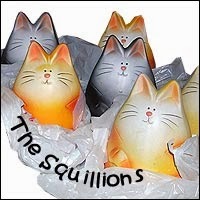 Happy Caturday and it is a special day. 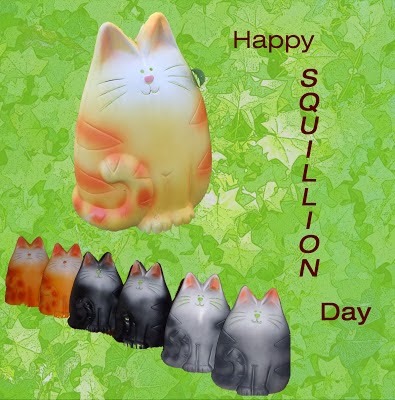 Squillion Day. So Virginger and all of her gang get to celllybrate. So I am going to turn this over to Virginger to let her tell her story! Thanks Ducky, you are a good mancat. Yep, Mum found me and I moved in with her and Derby. 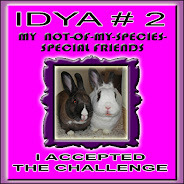 Plus we spread the word and lots and lots of my litter mates found homes with others out in the blogoshere. Mum fostered lots of the gang and I know they went to good places. 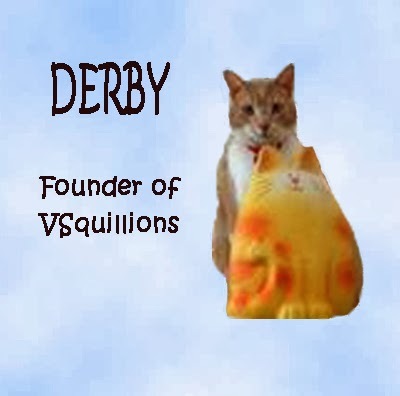 Two months gone, but yeah, Derby was the first and founder. We miss the big guy! Well you get to see half my whiskers. In other news, mum is sounding worse! She tossed and turned all last night in the sleepy spot and got up this AM, made a call and went back to bed! Said she couldn't hold her head up and didn't trust herself to drive she was so tired. So she stayed home, we napped lots including nearly three hours in the afternoon in the fevver watching chair. Mum keeps drinking lots of stuff, orange, tea, water, whatever. She is hoping she feels better enuf to day hunt tomorrow. We will see! So purrs to you mum, get better. I don't like to cuddle at night with mum if she won't hold still. I am afraid she will squish me! Yeah, me helping mum read her big fat book. She finished it last night. Now she plans to read smaller and skinnier books that don't take two weeks to get through. Mum's sniffles seem to be getting better slowly, but then she heads off to day hunt during the day and comes home all tired. The good thing is she goes to bed early so then I have more time to cuddle with her. Mum and me had a good weekend. Although mum has a case of the sniffies but she is doing fine and sleeps purrty well. Otherwise she rests lots and drinks lots and lots of tea. We had sunny Sunday and I took advantage of the sun puddles to nap in. The warms are not here, but at least the sun is warm. Have a good week all. Be warm. This is an older picture, me digging out from the blankie mum was working on at the time. Being under the covers is a grate place to be these days. Warm! Our usual blog hop sponsored by The Cat on My Head. Well the really cold stuff is gone for a few days, but still not warm enuf to have open windows. So lets think warm and wonderful thoughts. Purrty flowers and being outside in the garden. So lets all think of the stuff we like for the warms to come and maybe they will come sooner! Happy Purrthday to one grate dude. A cat magnet and NTM, Not The Mama to his crew of cats. 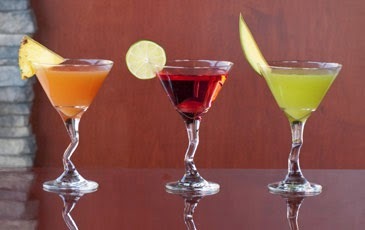 I am ready to party for the day before Lent. 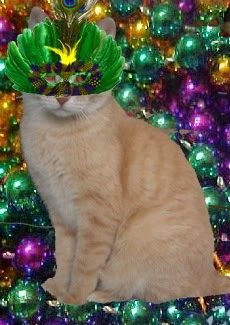 I've got my beads and mask! HiYa, Ducky here. 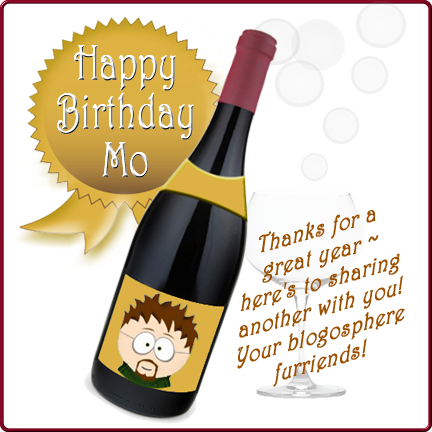 Well, maybe I can ask a thousand cats to wish mum a Happy Purrthday today? Yeah, do you think you could do that? Thanks. I even have a moovie so you can see what she looks like! I was even help groom her hair so she looks good. This was the moovies mum took on her new fancy phone thingy. The moovie program let her flip the video so you don't have to stand on your heard to view us! Mum says this day is a hurdle day in her life, she has past the age when the official people could start giving her, her green papers back for working. But she says she will wait a bit, then the pile of green papers will be bigger. Seems strange, no feetsball now for months and months to come. Mum says that is OK, it will soon be nice and won't have time to watch sports on the moving picture box. Plus on Caturday it was a nice sunny day and we can tell the days are way longer and the sun has come far enuf north that we see it on the big windows that go to the floor. Dats nice but I will just curl up with mum while she reads her big fat book. That means she doesn't move for a long time so I get to be with her. Lights on, mum pulled the stuff across the big windows to keep the warms in. I was sitting on one of the heaty spots. 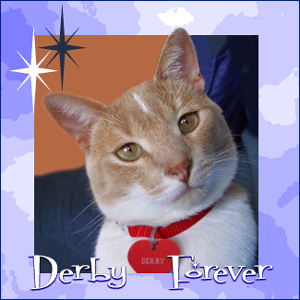 Derby used to like this one the best so I rarely got to use it. Now I can use any heaty spot in the house I want! Sunny but cold this morning. So a bit of shadow on my face. I am keeping warms sitting either by mum sucking up her heat or sitting by the heaty spots. Mum even closed the fabric things across the big windows that go to the floor. Keep the heat in our house! 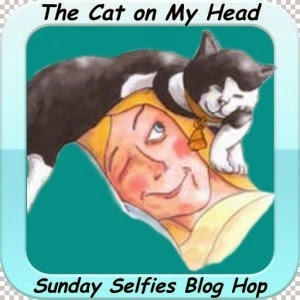 The usual Sunday Blog Hop, so hop around the blogoshphere with The Cat on My Head. HiYa, Ducky here. Happy Valentines Day to all of you. 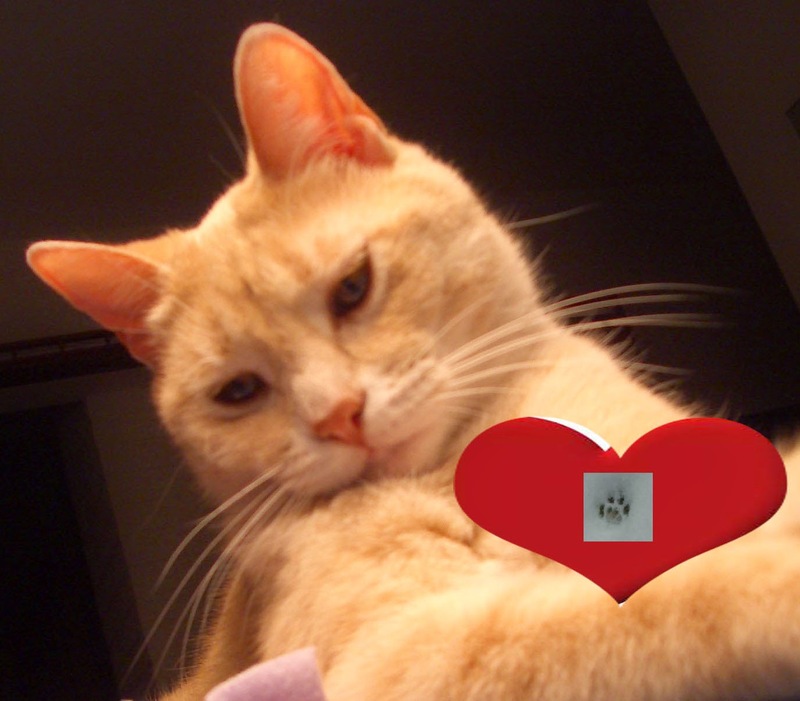 I want to specially wish my sweetie Dora a happy day with lots of love. I have her paw print on my heart. Thanks for all the Gotcha Day wishes. Me and mum had a good day. First she didn't go day hunting, so she was around more. She wasn't home all day as she had appointments and was meeting peoples for all three meals of the day, brekkie, lunch and dinner! It is a furry cold day here today, but sunny. We are staying in, although mum did go out to fill the fevver feeders. Then we watched fevvers on line for a little bit. Then we watched the new family at The Critter room with foster dad John. Plus we know Calico Mom Toni is fostering a new mum with four babies. Hope they are doing well. Mum is spending more time with her new toy, she had to get a new phone cuz the old one was almost deaded. Now the phone is smarter that she is, she has to look up how to do stuff. She is trying to find out why she gets mail, but it won't send mail. She did figure out how to transfer the pictures. But took a couple of short moovies, but they are upside down! She wasn't holding it the right way around. Still pictures she can flip, moovies I don't think she can! Wow just five short years ago, me and mum hooked up. It was a good thing for both of us. My first encounter with mum, still in the cage at the shelter, selling myself! At least she decide to take an extra look, as here I am in the meet and greet room where we got to check each other out a bit more. Didn't take long for either of us to say, let's do this! Safe in mum's sleepy spot, still in the PTU just arrived from the shelter. Mum got me in here afore Derby knew I was even in the house! Dats better, see my cute little face, but still not sure of what all was going on. Mum was cool and just let me come out on my own. I did and headed right under the bed! Later, things were good, so I jumped up on the bed with mum. I still like to sleep with mum. So now it is time to party. Cellybrate being in a wonderful home! My Gotcha Day is Friday. Come over to party! We had a nice quiet weekend. Mum had all sorts of time this weekend cuz no more feetsball to chew up her time. We had lots of snuggle time, she had enuf time to do all her chores and still have time to finish reading one book and then read another whole book on Sunday.